Georges-Pierre Seurat, who was born on December 2, 1859 was a Post-Impressionist painter from France. 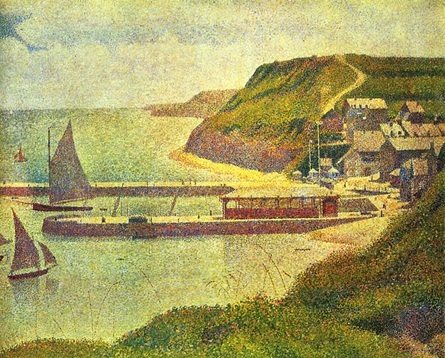 He devised new painting techniques called pointillism and chromoluminarism, which was also called divisionism. Divisionism is a style in modern art. It is the separation of colors into individual patches or dots that creates an optical interaction with the viewer’s eye once the colors are on the canvas. The colors used were pure, which were mixed optically when viewed. Followers of the style, called Divisionists, believed that the maximum luminosity was achieved through this technique. The first to develop this technique systematically was Georges Seurat. Georges Seurat was a very meticulous painter. His family was wealthy and this fact allowed him to experiment with various scientific theories of color that were put forward by several scientists such as Ogden Rood, Hermann von Helmholtz, David Sutter, Charles Blanc and Michel Eugene Chevreul. The outgrowth of Chromoluminarism was Pointillism, which literally used tiny dots of pure paint applied on canvas. 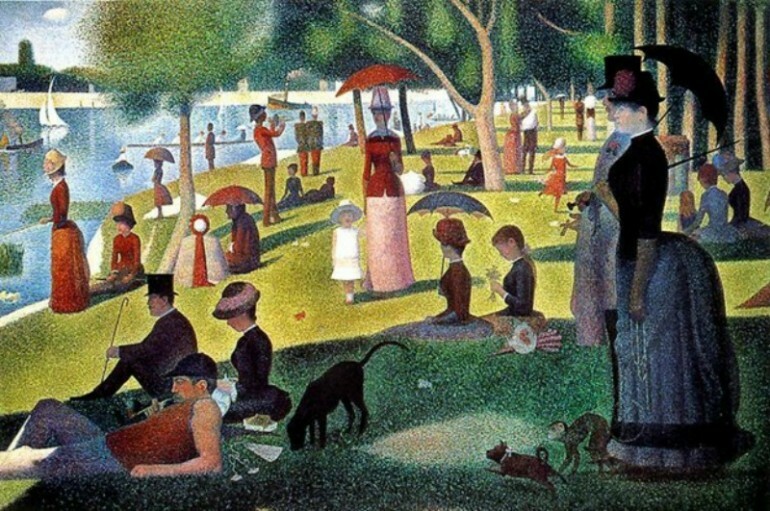 The best examples of this style were two of Georges Seurat’s paintings, Bathers at Asnieres, created in 1884 and located at the National Gallery in London and A Sunday Afternoon on the Island of La Grande Jatte, painted in 1884 until 1886 and which now hangs at the Art Institute of Chicago. This is one of his large-scale canvases and a late 19th century icon. In this technique, the dots of pure color are juxtaposed on one another so that the painting, when viewed from after seem to have premixed colors to achieve tonal gradation. The effect of the color juxtaposition is greater luminosity. You can say that Georges Seurat was not the first to try this technique. The application of patches of pure color were used by Claude Monet and Camille Pissarro, both Impressionist painters, which used the technique by chance because they wanted to capture the fleeting reflection of sunlight on objects when they were plein air painting. Georges Seurat on the other hand approached the technique scientifically and deliberately to achieve the shimmering effects of colors while creating his paintings inside his studio, with everything mapped out in great detail. Although the technique was called Pointillism, Georges Seurat preferred to call it Divisionism. The style became quite popular in France from the 1880s to the 1890s. After the death of Seurat, Paul Signac became its most active proponent and made the technique alive once again. Jan Troop, Maximilien Luce, Theo van Rysselberghe and Henri-Edmond Cross are just of the succeeding followers of the movement. Vincent van Gogh tried it also in some of his works, just like others such as Giacomo Balla, Robert Delaunay, Jean Metzinger, Andre Derain and even Henri Matisse. It was not just them that tried Divisionism, other major Post-Impressionist painters tried it as well. What influenced Seurat on Chromoluminarism early on was Charles Blanc’s treatise called Grammaire des Arts du Dessin. Blanc explained that the optical mixing (of colors) by the eye of the spectator make it possible for the colors to have purer and more vibrant color effects, drawing from the ideas of French painter Eugene Delacroix and French chemist Chervreul. However, there is something wrong with the proposition because the viewers were still able to see the paint dots as separate colors. However, it should be noted that the colors did intensify slightly and indeed produced a shimmering effect. These effects were documented by Odgen Rood in Modern Chromatics that he wrote in 1879. The technique also allowed the paintings to hold up in terms of composition and color. After serving for one year at Brest Military Academy, Seurat returned to Paris and concentrated on mastering monochrome drawing for two years. He was able to exhibit his first work at the Salon in 1883. It was a drawing of his best friend, Aman-Jean, using Conté crayon. During this time Seurat was also doing a careful study of the works of Eugene Delacroix, particularly on how the colors were used by the artist. Seurat’s first principal painting was the Bathers at Asnières, which he did in 1883. His use of light tone and color showed the influence of Impressionism. But the Impressionist influence ended there because Seurat made several drawings and oil sketches to prepare for his work before he painted his canvas in the studio. In 1884 he started his other major work, the large-scale painting entitled A Sunday Afternoon on the Island of La Grande Jatte. It took him two years to finish this 3-meter wide painting, which showed members of the different Parisian social classes engaged in several activities at a park. A major part of his time was spent preparing for this painting, taking several trips to the park to do sketches. There were about 60 sketches that he did for this painting. He also created a smaller version of the painting, entitled Study for A Sunday Afternoon on the Island of La Grande Jatte, which can be seen at the Metropolitan Museum of Art in New York. It became the inspiration for “Sunday in the Park with George,” a musical created by Stephen Sondheim. Georges Seurat died very young. He was only 31 when he succumbed to a possible complication from a combination of several ailments, including diphtheria, infectious angina, pneumonia and a form of meningitis. He produced some 240 paintings during his lifetime. His last work, entitled The Circus, was not finished before he passed away.